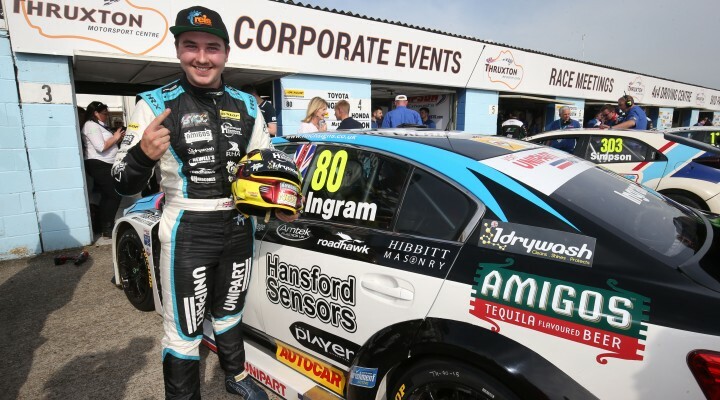 Tom Ingram has taken his second pole position of the season after the young gun broke the Thruxton lap record during qualifying for Round 10 of the 2016 Dunlop MSA British Touring Car Championship. The Speedworks Motorsport driver experienced a stressful opening to the session as he had his first two flying lap times removed by officials for not respecting track limits. Ingram wasn’t alone in being pegged back, however, as a host of drivers were penalised for cutting the final chicane in the early stages. Championship leader Matt Neal was among those to be demoted, but the multiple champ responded brilliantly with a staggering lap time in his ballast-laden Honda Civic Type R. The Halfords Yuasa Racing driver held provisional pole until Ingram’s effort, and he would eventually have to settle for third due to a Flying Scotsman. Ordinarily you would expect that term to be reserved for reigning champion Gordon Shedden, but on this occasion it was impressive teenager Aiden Moffat who wowed the crowds. The young Laser Tools Racing driver starred during practice earlier today and he duly backed that up by making the front row in qualifying – his best ever result. Neal had parked his Honda long before the finish, believing that he’d dragged every last ounce of performance from his car. Although dropping to third late on, the experienced racer will be pleased to have fended off another eye-catching attack from MG’s young duo. Ashley Sutton and Josh Cook produced a front row lock-out at Donington Park last time out, and will start tomorrow’s opener from fourth and fifth on the grid, with the latter getting the better of his rookie team-mate on this occasion. Both drivers worked together for much of the session, benefitting from a tow through Thruxton’s high-speed sections for each of their best-timed tours. Adam Morgan confirmed the performance of the Mercedes A-Class by planting his WIX Racing machine inside the top six – a result that had seemed some way off earlier today after a high-speed shunt forced the squad to produce some substantial repairs. Jeff Smith made the top ten for the first time since Rockingham in 2013 as the Eurotech racer ended up just 0.015s behind Morgan. Andrew Jordan couldn’t match his practice pace and ended up eighth in his Pirtek Racing Ford Focus, whilst BKR’s Aron Smith and WSR’s Sam Tordoff completed the top ten order.